...GOD has been placing on the hearts of His saints for decades to pray for a new work in downtown Memphis like the one we are preparing to plant? ...GOD has been preparing the hearts of many to hear the gospel of Jesus Christ from the lips of someone connected to Grace Church, leading to their conversion experience, spiritual development, and involvement in world missions? ...GOD is "stacking the kindling" in the hearts of believers in the Mid-South who's prayers and resources will be used by God, because of the influence of His Spirit through Grace Church, to bring the gospel some of the 693 untargeted people groups in the world who's population is over 100,000 people? ...GOD has been causing the residential resurgence in downtown to serve as a parable to the city of the spiritual resurgence that is on the horizon? ...GOD is moving the hearts of those in dozens of Memphis' churches to yearn for a new day of grace in the city of Memphis, the Mid-South, the nation, the world? ...The desires to see Grace Church become a beacon of the light of the "glory of God in the face of Christ" for the downtown area of Memphis is too small of a vision? ...GOD provided more resources for Grace Church than dreamed, which enabled her to plant more churches, and initiate more catalytic gospel efforts around the globe? ...The greatest prayers that have been prayed for Grace Church were answered "exceedingly abundantly beyond all we ask or think?" Thank you for praying for the youth retreat I was able to speak at last weekend. The Lord was/is at work. Please pray again for "far seeing grace" this week as our pastoral planting team will be together in Minneapolis for seven days beginning Thursday, January 26. We are approaching mega-church status with our blog! Scroll down to the bottom of the screen to see if you are the lucky 1000th visitor. (Obviously, this is a pun. 1000 hits are recorded on many blogs in a single day, much less 5 months)! Pass on the word about SolusChristus.blogspot.com! Please pray for me and the high school students of Bethlehem's downtown campus as I speak this weekend for an annual winter retreat. May God be glorified through Jesus, to Whom belongs the glory forever and ever! I'm enjoying a Leadership Network event in TX this week. This community is comprised of church planting leaders from thirteen churches from across the country who are, uniquely poised to be catalytic leaders of church planting movements. I was able to tag along with Bethlehem Baptist Church. Oh, how I pray that the Lord will use Bethlehem, Grace Church, and many others to initiate such a movement for the glory of our great God through Jesus Christ! Thank you for your prayers for the planting pastors of Grace Church. 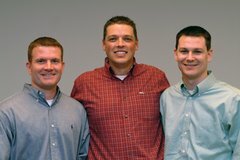 Bryan Smith, Nathan Sawyer, and Jordan Thomas are thankful to God for the technology that allows us to have our weekly 3-way conference calls. These conversations have been monumental to keep us on the same page while we are miles apart from one another. The opportunity to talk regularly is a wonderfully unifying blessing. Confirmation about our dream, and excitement about getting started, escalate each time we talk. Also, we are being helped by the Lord to think about the foundational aspects of Christ's church. We thank the Lord for the unifying vision He has provided, namely, Himself! Theodicy is the theological term for the problem of evil. If God is all wise, all good, and all loving, how could it have NOT been sin for God to have created beings with the potential for sin? Every conservative evangelical will agree that God is sinless! The question of the origin of evil, and more, the meaning of evil, is far less agreed upon. This is an age-old question that has been debated in classrooms, pews, and coffee shops. There exists a range of responses to this question from "It is because of man's free will," to "I think it was an accident that God didn't forsee," to "It is not sin that God will that sin be." I've never heard a more biblically sound response than that given by my pastor, John Piper, at a recent conference. Personally, I have stood for the latter of the three responses listed above for quite some time. In light of Pastor John's sermon, I am even more thoroughly convinced than ever! This sermon was given as the final message at the "Suffering and the Sovereignty of God" 2005 National Conference. You can visit the link below and scroll down to the sermon titled, "The Sovereignty of God and the Sufferings of Christ" to listen for free. We are asking the Lord to raise up at least 500 prayer partners for Grace Churce BEFORE we begin our efforts in Memphis. If the Lord is inclining your heart to "join us on your knees," then notify us and we will add you to our intercessor update list.